Teaching is tough...let's help each other be tougher! If you are like me and enjoy scrolling through Pinterest, you have probably seen the term Hygge. I have to admit that the first time I saw the word, I assumed it was some weird New Age religion or some type of yoga pose. HAHA! It is not and the more I started reading about Hygge, the more I loved the concept. For those of you that are clueless like I was, Hygge is a Danish term that doesn’t really have an exact English translation. Loosely translated it is the concept of living a cozy, comfortable life. It is all about finding joy and peace within your environment. During this winter and the holiday months, I have really been trying to focus on this in my own life. Hygge, to me, is fuzzy socks and hot chocolate on a cold morning. It is reading a relaxing book by soft light at bedtime. It is a candle-lit bubble bath after a stressful day. Hygge is a personal thing. What brings you joy, comfort, peace, etc.? It will be different for all of us but the goal is the same. The more I thought about how I can incorporate Hygge into my daily life at home, the more I realized how important hygge is in the work environment, especially in schools. So what are some ways that you can make your classroom one of joy, comfort, and peace both for you as the teacher as well as your students? Here are some of the ideas I have come up with and I would love to hear your thought below about ways you can do this in your own classroom. 1. Make your teacher space cozy. Add a comfy rug and small lamp to your desk area. When I was in the classroom, I used to like to keep fuzzy socks in my drawer so that during my planning time, I could take off my shoes and wear my comfy socks to relax my feet. 2. Have snacks, warm drinks, etc. available. I had a Keurig and made hot chocolate and apple cider during the winter months. I didn't have the discipline to handle it but I know people that would keep candy/sweets in a drawer for those times when you need a treat. Don't do this if you are like me and will eat the entire package. The goal is to be cozy, not to gain 10 pounds. 3. Have a regular AM and PM routine so that you start and end your day with an organized routine. It will help you not to feel as stressed. 4. If you can, put your cell phone in a drawer and leave it there. Remember before cell phones? We all survived and honestly, we were a lot less anxious. There is no reason you need to be texting, checking Facebook, etc. all day long. Give yourself some much needed time unplugged to actually spend with your students and getting work done. 5. Find ways to make incorporate softer lighting. Fluorescent lighting (like most schools have) has been showed to cause migraines and anxiety. When you can, use floor lamps, natural light from windows, string Christmas lights around the room or turn off the lights. I liked to turn off the lights if my students were working on their Chromebooks independently. It was amazing the way that everyone seemed to naturally calm down when the lights were low. It would become rather peaceful. 6. Get close to nature. Incorporate plants into your room and open the windows on a pretty day (if you are allowed). If your school allows it, take your class outside on a sunny day to do independent reading or writing. There is just something about sun and Vitamin D that lifts a person's spirit. 7. Include comfortable and flexible seating options. Some teachers go all out and get rid of desks. I never went that far but I did have rugs and some cozy chairs that students could sit on during group work. There were only a few but these were the coveted places to sit in my room. It was also nice to have these cozy chairs when I wanted to grade during my planning period or after school. It was nice to sit there instead of at my desk. 8. Use music. Just like lighting, it is amazing how music can change the ambiance of a room. I used to love to play instrumental music, typically Disney or other movie soundtracks, while students were working. I was also known to come up with funny songs to sing to my students as well. Yes, I am totally that corny teacher and I enjoyed it! 9. 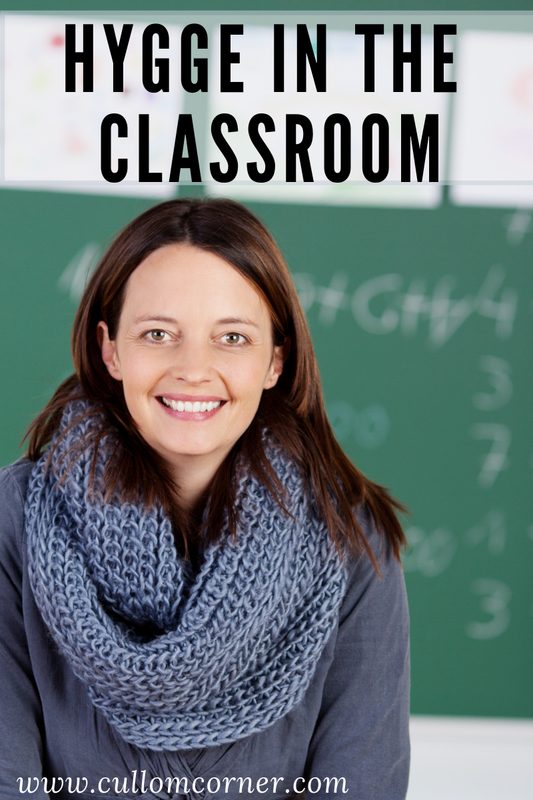 Keep your classroom neat, tidy, and minimal. This is where I always failed. I have always been a clutter-bug. But we all know that there is something so nice about a tidy and organized space. So do the best you can and make your students responsible for tidying spaces as well. 10. Hygge is all about individuality. What makes you and your class comfortable? What brings you joy and makes you want to enter your classroom every morning? I encourage you to sit and think about this question seriously and find ways to make your classroom a place filled with peace, joy, and comfort. Make it a "home away from home" for both you and your students. It is worth the time and effort. You and your students deserve it. Any other ideas? I would love to hear your thoughts and additional ways that you either already incorporate hygge ideas or plan to use them. All original work is copyright Cullom Corner 2016. Powered by Blogger.